This machine consists mainly of pressure sensor and it can be used in a wide variety of instrumentation applications. Its use of an LCD (Liquid Crystal Display) simplifies settings. 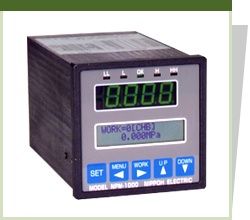 Scales and offsets for various types of input and display units can be set freely. Types of input consists of 4 channels (0 ~ ± 2V/0 ~ ± 20V) Voltage inputs and 2 channels (4 ~ 20mA) Current inputs. When any measured value exceeds one of the LL, L, H or HH settings, an external signal will be output. The measurement readings can be held in the display, allowing you to view both peak and bottom values on the display. Unbelievable price on Process Meter NPM-1000A in Seremban (Malaysia) company Bestever Enterprise.